During my trip to Nova Scotia, I stayed at the lovely Atlantica Hotel & Marina Oak Island (https://www.facebook.com/AtlanticaOakIsland). The hotel reminded me a bit of the resort in the movie Dirty Dancing. There were plenty of activities from trails to walk to swimming to spa treatments and mini golf, tennis, fire pits and more to keep a family busy. Rooms varied from hotel rooms to chalets and a marina was located right behind the lodge. 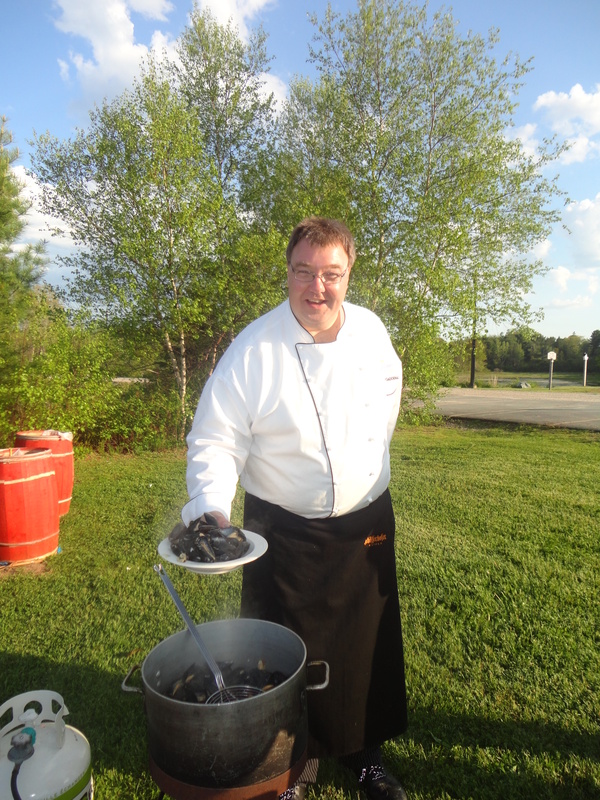 The Atlantica was a cool place to stay especially since we were greeted with a cookout on the shoreline by Chef Konrad where we had mussels topped off with Nova Scotia wine. While we sat around the fire then later dined on Chef Konrad’s delectable dinner we heard the story of Oak Island which sits right off the shoreline of the Atlantica. Charlie Barkhouse took the time to tell us all about what he called the ‘World’s Longest and Costliest Treasure Hunt’ which has been covered in a History Channel series, The Curse of Oak Island. In the hotel, there is an Oak Island Museum that offers items from the history of the treasure hunt that has been going on for over 200 years. Before checking out, I took a long walk along the nature trail and down by the shoreline. Nothing beats sunrise over the ocean! The Atlantica Hotel & Marina Oak Island is an oceanfront property with guestrooms, oceanfront chalets and seaside villas, situated in the community of Western Shore in Nova Scotia’s beautiful South Shore region. Enjoy our serene and peaceful atmosphere in our stunning surroundings with breathtaking views of picturesque Mahone Bay and the legendary Oak Island. The hotel offers 104 hotel rooms and enough activities to make this a truly marvelous vacation. This is a great place to be situated to check out the nearby sites like Lunenburg – a UNESCO World Heritage Site – with a historic waterfront and Fisheries Museum of the Atlantic. Other nearby experiences includes Ross Farm, Nova Scotia’s Living Museum of Agriculture; the charming town of Mahone Bay; and the scenic fishing village of Peggy’s Cove. Previous Post: Acadian Maple Syrup opens their store to tourists wanting to learn more. excellent post, very informative. I’m wondering why the other experts of this sector don’t understand this.